Whenever we play at home on a Friday night, my next question is what to do for the rest of the weekend. Crossing the Channel to see some type of European game is very often an option  but it is an option with a cost, and the worst part of the cost is not monetary, but the fact that one needs to be up early in the morning. After the Luton game, I choose a match in the eighth round of the French Cup  the kick off was 2 p.m. (French time), and the location was only a 90 minute drive from the Eurotunnel terminal at Calais. But with Christmas coming, we all (I had two passengers with me for the trip), needed to stock up our drinks cabinets, and get some potential presents, so we decided to head to the Belgium border town of Adinkerke, centre of the cheap tobacco/ booze runs for a quick stop on a way out  an extra 60 minutes required. So I needed to be at Calais by 11.30, and we always allow some spare time, so this becomes 10.30, 35 minutes in the tunnel, 30 minutes check in time and an hour time difference between the two countries means being at the Folkestone terminal around 8.30  and that means leaving home before 6 in the morning! The French FA Cup is run on similar lines to the FA Cup, with the weaker teams starting at the beginning of the season, and stronger teams being exempt for a number of rounds, until the elite come in to create a straight 64 team knock out contest in from the first week of January. Second division teams in France, however, are not part of the elite as they are in England, and have to face an extra round compared to their counterparts this side of the Channel. (The French third division clubs, co-incidentally do start their competition with the same number of rounds to play as our level in England). There are no replays in France, though  all matches are decided first time out. There is also a rule that demands that certain matches must be played at the venue selected by the smaller club. If this rule was applied in England, League-2 clubs would always be at home when drawn against Premiership, (but not League-2 against Championship, or League-1 against Premiership), where as a League-1 club could not be at home to a club below the Conferences National division. These rules tend to allow more small clubs to progress further in the French cup then might happen in England  but also allows such progress to go through with less remark. 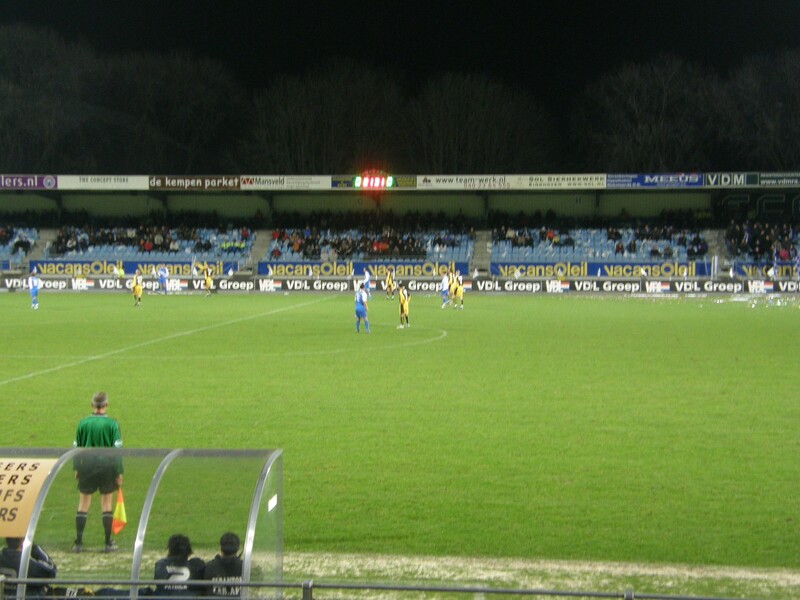 Most of the football grounds in France are the property of the local authority, so while clubs always do have a place to call home, this may be shared with another local club  it does mean that most grounds are similar in construction  a running track and a single stand, regardless of the level the club plays at. The fact that the council owns and runs the grounds, means that clubs do not have pay vast amounts to improve grounds as they progress up through the leagues  but anyway, French clubs do not have the long list of increasing standards for every promotion, and crowds for French football are low for all levels below the professional level. I cannot say that I had actually heard of Olympique Marcquois more than a few hours before I decided to go there. It was a simple case of looking up the fixtures for the cup on the web page, then finding out where they played, and finally checking up the level they played at. So in reverse order, they play in Division Honneur Regional for the region of Nord Pas de Calais. This is the seventh level of French football  the seventh in England is the Southern League Premier Division and two other regional variations, but Southern League clubs have only 160 clubs in more senior Leagues to consider  the more extreme regionalisation of the French system means there are more than 600 ahead of Marcquois in the system. The locality is in the suburbs of the city of Lille, an area of mid-rise apartment buildings strung along a busy thoroughfare. The ground turned out to be a spacious area, but with the exception of a small stand, all the ground surrounds were level. The visitors, Sedan were relegated from the first division at the end of last season but currently lie in mid-table, and are unlikely to return to the top division this season. I remember quite clearly my visit to Sedan in 1999, towards the end of one of the most successful seasons in the club history  on arriving in the town, I found everything was decorated in red and green  the club colours, and the place was alive with anticipation. Seeing great red and green banners hanging down the sides of high rise blocks around the ground, I could not help contrast this with the fact that two days previously in Cheltenham, it was only the fans that gave away the fact there was a big match going on. (I was in Sedan on 24 April 1999, 9492 watched them draw 1-1 with Nimes, leaving them close to winning promotion to the French Division One  two days earlier, a capacity crowd had watched Cheltenham beat Yeovil 3-2 to clinch promotion into the football league). As well as winning promotion in 1999, Sedan reached the final of the French cup, losing to Nantes in the final  co-incidentally, Nantes finished below Sedan when they returned to the second division last summer, while Troyes who were the third promoted side in 1999 were also relegated. (both Sedan and Troyes were also relegated in 2003, although their most recent promotions were not in the same season). A potential mismatch such as this one would probably fill the ground in England, but not so in France. The stand was about full, but could only hold around 300  I had no difficulty in spending my 8 on a stand ticket less than two hours before kick off. The total crowd did not exceed 1000, with no more than 50 making the trip up from Sedan. The police making a great effort to keep these few segregated from the rest of the crowd. For a while it appeared that we had the potential for a giant-killing. Sedan took the field in a very cautious 4-1-4-1 formation and were shocked when Marcquois took the lead through Elaarrasi after just four minutes. The visitors then held most of the possession through the first half, but rarely troubled their opponents defence, and a breakaway attack allowed Marcquois to double the lead before half time. In the second half, sedan turned the screw and the superior fitness and ability of a professional outfit eventual came through, even though it was done without any recourse to style or finesse. Moussa Sow, a player of Senegalese descent on loan from Rennes and the most impressive footballer on the field scored twice, while Chiguy Lucau scored the other and Sedan won through by 3-2. Our party of three did not stay put after the match  instead we negotiated Belgium from South to North to arrive in the Netherlands only two hours after the match had finished. The city of Eindhoven hosts a football club that has won many honours in Netherlands and European football  but that was not the club I was going to see. FC Eindhoven were once considered the equals or even better than their rivals PSV  but they have not won a championship since 1954, and have now spent thirty consecutive seasons in the lower division of the league. It is probably just as well for them that the Netherlands is one of the few countries in Europe without direct relegation from the professional to amateur leagues, as it is unlikely they would still be at this level. The ground, in the southern suburbs of the city is a neat enough stadium, with seats on three sides of the pitch, and no spectator facilities behind the north goal. The biggest problem we had as spectators was the fact that the match was a local derby (against den Bosch), and had been designated as high risk by the notoriously nervous local police. Officially this means that tickets are only on sale to holders of membership cards, with away fans having to buy their own tickets in advance at their own club. 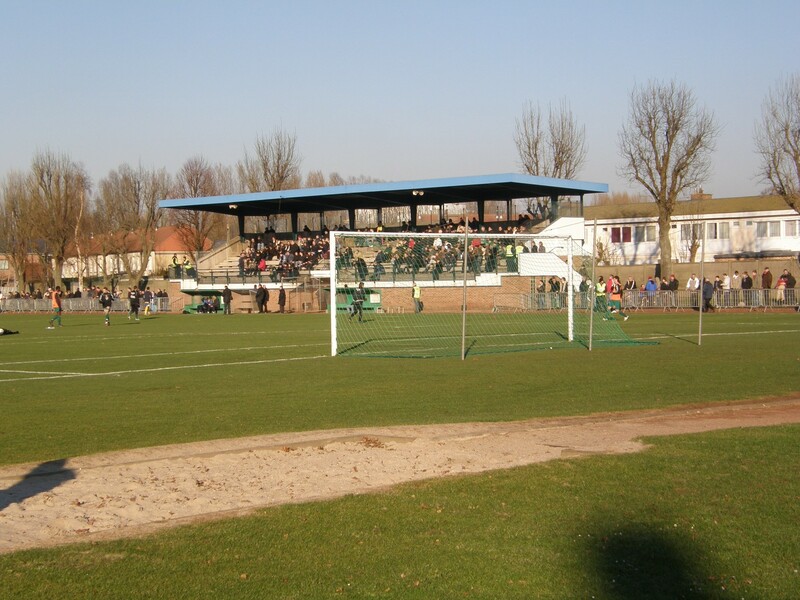 In practice, they allow fans in who can prove they do not live in the wrong place, although just before I entered, I watched a debate with one spectator using his driving licence, and the officials trying to decide whether his village was nearer to Eindhoven or Den Bosch. I had e-mailed the club in advance and been told I could not get tickets, I then phoned, spoke to an official and e-mailed again  this time being given a press ticket. This was without any evidence of being press, and haven spoken to the same people in attempting to buy a ticket and then getting my freebie! They said on the gate, that they would have sold me a ticket anyway. The crowd ended up as 1475, with less than 100 coming from Den Bosch and being the group that sang and chanted in support of their team during the game. The home crowd was silent, until a late goal broke the deadlock in their favour. Eindhoven still do not look like changing divisions this season, while Den Bosch, relegated in 2004 qualified for the end of season play offs with a good run in the first six games of the season. As they are unlikely to take the title and automatic promotion, they can now sit back and relax until April and the play offs. You are currently browsing the Football Shaped blog archives for January, 2008.